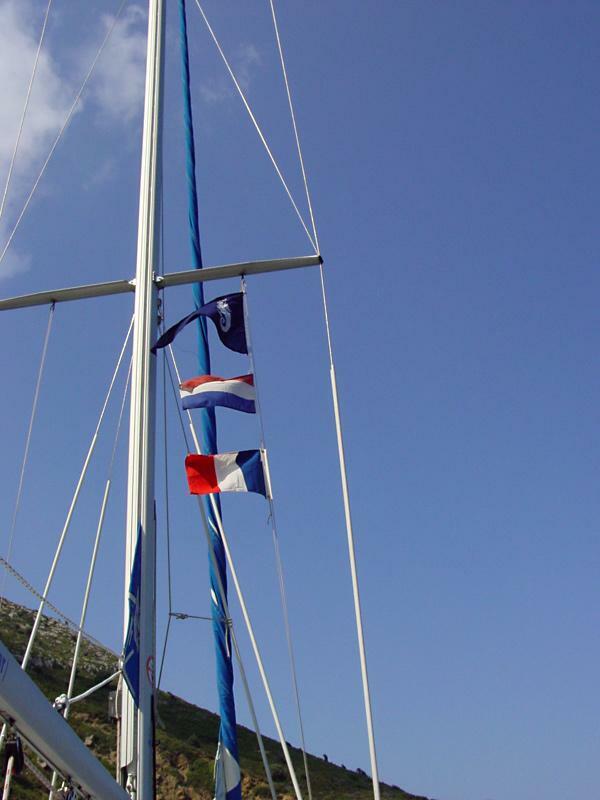 The photo shows our yacht sailing under the RORC burgee and shows our national flags under the starboard spreader. I am a member of the Royal Ocean Racing Club, hence that burgee. Yet, Greece is so beautiful that I rather cruise than race in these waters. The best sailing grounds in Greece are the Cyclades, Dodecanese, Northern Sporades, Argolic Gulf, Saronic Gulf and the Ionian. Unfortunately, the north of Greece as well as the south of the Peloponnese has few options to charter a yacht. Moreover, the island of Crete is not popular by sailors and has therefore little to offer; no yacht charter companies in this area of the Aegean Sea. Finding reliable charter companies in Greece. On longer sailing holidays (2-3 weeks) you could well choose a one-way from one area to another, an excellent one-way is Paros to Rhodes for instance (2 weeks) or Samos - Rhodes (2 weeks) or Athens - Kos (2 weeks) or Athens - Rhodes (3 weeks). In case of 4 weeks or longer a one-way doesn't serve any good point and a round trip makes much more sense as long as you restrict your sailing holiday to Greece and have no plans to cross the border with for instance Turkey. When crossing the border to Turkish waters make sure you have the Turkish courtesy flag on board. Officially you should only raise this flag after the authorities have granted you clearance. Until this clearance is obtained you must fly the yellow "Q" Quarantine flag instead.
.: Back to our sailing logbook of the Sporades :.